Christ e-bay is dull. I made the dumba mistake of putting something on for a quid thinking - that'll get them going - and it will go for lots and lots (finger to bottom lip, strokes white fluffy cat on lap and throws head back to laugh evilly). No it won't - it went for bloody £1.70. And then - I clearly stated buyer collect. No they won't collect - I've been enviegled into having some clandestine meeting on the Silverlink platform at Richmond Station tomorrow morning for the handover (aside: no doubt Swipe will be observing undercover from his beige Mini Metro in the disabled section of the carpark). She gets a premium Graco 4-in-1 Travel System (pram thing) and I get a postal order for £1.70. Oh woopie bloody doo! But...it is all in a good cause and I suppose I don't mind as I found out that she has 6 kids one of which (the teenage daughter) is pregnant. She also told me that her neice (also a teenager - ooh the youth of today!) had just had a miscarriage and they wanted to try again so between them the £1.70 bargain will be worth its weight in gold. I arranged that today in between meeting my very tall (6'7") dear friend Alex for lunch and then taking secret pictures of crack addicts outside a drop-in centre in Endell St while we had a coffee. I don't know why I did it but I did. Probably for the same inexplicable reason that I always manage to make eye contact with weirdo's on the street. Just can't help it. Alex then made me go and see a clairvoyant Tarot reader man called Jan at Mysteries in Monmouth St. He said my aura colour was very yellow and that I had a fantastic relationship - full of devotion and love. I had to eventually correct him and tell him that actually I am teetering on the brink of separation/divorce (not married but same scenario'ish). I then managed to pick the Death card to signify my other half. I nearly laughed out loud and did sort of smirk as Mr Reader looked very uncomfortable about this. And then he basically told me to do what I was doing already - biding my time, trying hard and not quite giving up yet blah blah blah. I was marginally more concerned about a work proposition I've had lately and he said 'oh yes - just go ahead and do it'. Great. Thanks. Really glad I just parted with £30 to be completely misread and then hastily told what I sort of already know. If anyone is reading this blog which I'm sure they are not as I do note pop-pickers that not one of you has offered to help me with my wireless predicament. It's really easy - it's just that I can't do it. Oh alright - £150 cash then but no more. At this rate - perhaps I will end up here? 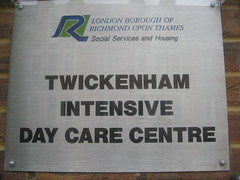 Can anybody actually explain what 'intensive day care' is? I have visions of earnest care-workers dealing with elderly people in a really tortured, intense way. 'Ok - cup of tea? I said cup of tea? It's really hot it's really hot - quick - drink it . That's it DRINK. Ohmygod you've burnt your tongue. Ok. That's it. Everybody out, everybody out. Bless the Richmond Social Services and Housing Team for coming up with that sign. Is it different from the normal Day Care Centre I wonder? What do you do at a Day Care Centre anyway? My granny used to go to one to help look after all the 'old boys'. Most of them were younger than her. Maybe she was looking for a septegenarian toyboy? Intense. Before I put a breeze-block into my lap-top screen and snip the wires of the broadband forever in a feverish rage of 'can't do it!'. I'm offering £100 cash to anyone in London who can come and sort my wireless out (ie: connect a Netgear box to my stupid usb broadband thingy because I am an imbecile and can't do it). Any offers - where are my mates when I need them? Got uber-blogitis. Ie: blogging has been feeling a bit like homework lately. I was thinking of giving up like the fabulous surlygirl but decided I'll give it one more bash. To be fair - my head is a bit full with unsettled home things at the moment and I feel like I'm wading through blancmange some days. Had a bit of a Room 101 moment this week - bloody St George's Day flags hanging out of white vans really piss me off. And people walking about with those horrid nylon tops with the flag on that too - hate it. Another little quibble is that I really wish people would stop whinging about how many Eastern Europeans there are everywhere. Yes, there do seem to be alot but so what? At least they are working and most likely being paid a pittance compared to what alot of us would be prepared to accept for the same job. There seems to be uproar down my road (mainly with the older residents) as the local shop has put a sign up saying 'we now stock Polish food'. Integration - what's wrong with that? I'm trying amongst other things to write a book at the moment which involves having to wander about and go for coffee somewhere away from the house now and again. All I wanted was a nice quiet coffee yesterday. I headed for a cafe on the the river and found a good spot with a great view. I was just heading for my chair when I noticed a deranged girl coming my way screeching and swinging her shopping bags at me. I then realised I had seen her only five minutes earlier shouting at the rasta that makes fresh expensive smoothies for tourists further up the towpath. She had a carrier bag on each side heavy with fruit. In fact, I think the smoothie-guy had given her the fruit but I can't be sure. Because I'm rarely shocked by anything I just sort of ignored her and skirted round muttering and tried not to let my finely balanced latte muffin combo be knocked over by her randomly flailing fruit bags. Then I did the thing you are told never to do - I looked her straight in the eye. I can't help it. I can't even tell you why I did it but I always have. And nothing, her eyes were dead. Her teeth were chattering and her chin was wobbling which made me think she might have been hallucinating. So I just walked around her and sat down. Finally, she wandered off down the towpath after bashing the owner of the cafe around the neck with her bags which he took really passively which was disturbing in itself. Suddenly, I was besieged by pigeons - lots of them. It was awful. So now I am the one flailing my bag and squeaking madly, well swearing actually, as they swooped, flapped and cooed for my muffin in a un-relenting Hitchcockian fashion. Basically, I bashed a few really hard and they realised that if they came near they would get hurt so they sort of hovered which was actually just as intimidating. Suddenly, another commotion further down. I could see a woman holding up her mountain bike like a shield protecting herself from the fruit bag girl who was really going for her. It was pretty bad. The fruit girl then turned on a woman with a child in a buggy who was cornered and terrified for a moment unable to get away. Meanwhile the pigeons have taken advantage of the diversion and tried to land on me again. So I got really pissed off and called the police. Of course they seemed to take ages to get there meanwhile more and more people were running down complaining of being set upon by the mad bad fruit girl. Eventually the police arrived and ambled down soooo slowly it was a joke. They sauntered back saying that she had gone too far and they had to go further up to try and corner her. Me, I finished my coffee in one as it was now cold and abandoned my muffin to the birds and went back home. My idyllic twenty minutes on the river was nothing but a fraught moment in time. I'm staying in today. for being as tardy as myself - talk about the pot calling the kettle black. and of course my boss Robert Swipe - I have to comment on his site and keep him in check as I am his long-suffering Area State Co-ordinator you know! Just going off to vote - oo-er - such choice! It is remarkably self-centred and self-congratulatory. It’s certainly not ‘Money’ (which you feel he kind of aspires to) and it is almost a bit like a ‘lad’s’ lazy Bridget Jones. I can imagine it being serialised and then packed up in plastic for free on the front of the Observer before long. He’s not a bad writer - but I think there is a better book to be had out of him. Or perhaps he will suffer from Alex Garland syndrome and dry up?? Who knows. Him and his wife seem to have fashioned themselves as the Posh and Becks of the literary world. No wonder they are both on the receiving end of so much backlash. Perhaps I was a little harsh - I know how hard it is to write anything well let alone a book. Anyway - I really am going off to vote now.